sometimes include H, S, N and O in their compounds! without knowing too much about them. 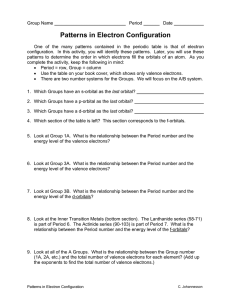 and Groups 13 – 18 are the p-block elements. oxidation taking place. How many electrons are being transferred from Na to water? element which does not form a stable trication (B3+ again will have too high a charge density to be stable). Q. Why do the other elements form trications? have a full valence shell. electronegativity. AlF3 for instance is ionic (ΔEN = 2.5) but AlCl3 is covalent (ΔEN = 1.5). covalent compounds. Tin and lead are also happy in the +2 oxidation state. these elements (see the periodic table in tutorial 1), especially -3. 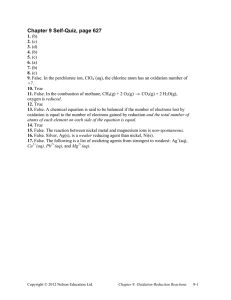 What is the maximum oxidation state possible for the group 15 elements? The maximum oxidation state is also known as the group valency. the formation of the -2 oxidation state but sulfur in particular can exhibit a variety of oxidation states. What is the oxidation number of sulfur in each of the following species? states, when bonded to oxygen. accommodate more than 8 valence electrons. Why do the second period elements not have any energetically available d-orbitals? a different chemistry from their congeners. physical properties are that we will be talking about. Atomic Radius (r): This is half the distance between the centres of neighbouring atoms in the pure element. distance between the two chlorine nuclei in Cl2 is 198 pm. Hence the atomic radius of chlorine is 99 pm. solid ionic substance. Ionic radii are also measured in pm. The atomic radius of an element is not the same as its ionic radius. Consider for example the element sodium. What is the electronic configuration of sodium? What is the electronic configuration of the sodium cation? remain. These core electrons are closer to the nuclei than the valence electrons and are thus tightly bound. Cations are always considerably smaller than their parent atoms. How about anions? The atomic radius of chlorine is 100 pm. The ionic radius of chlorine is 181 pm. 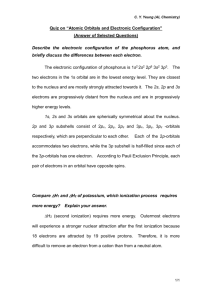 What is the electronic configuration of the chloride anion? existing electrons (since like charges repel) and the space taken up by the electrons expands. Thus anions are always substantially larger than their parent atoms. The atomic radius of aluminium is 125 pm while the ionic radius of the same element is only 50 pm. The ionic radius of oxygen is 140 pm, 80 pm larger than its atomic radius. 2chloride is 246 pm. Given that the ionic radius of O is 140 pm, calculate the ionic radius of Cl . electron from the ground state of a gaseous atom. hypothetical i.e. the electrons do not exist as separate species in solution. electron from a neutral gaseous atom. remaining electrons. Let’s take aluminium as an example. than the valence electrons. It therefore takes much more energy to remove them from the atom. I1= 736 kJ mol-1; I2 = 1 450 kJ mol-1, I3 = 7 740 kJ mol-1. when an electron is added to an atom or an ion of the element. As we proceed down any of the groups the atomic radius is seen to increase. can be shown in the diagram below. experience a greater effective nuclear charge as we go across a period from left to right. Atomic size increases down a group. Why in the previous section did we use the term “effective nuclear charge” when describing nuclear charge? increased and the added electrons are poor at shielding each other. 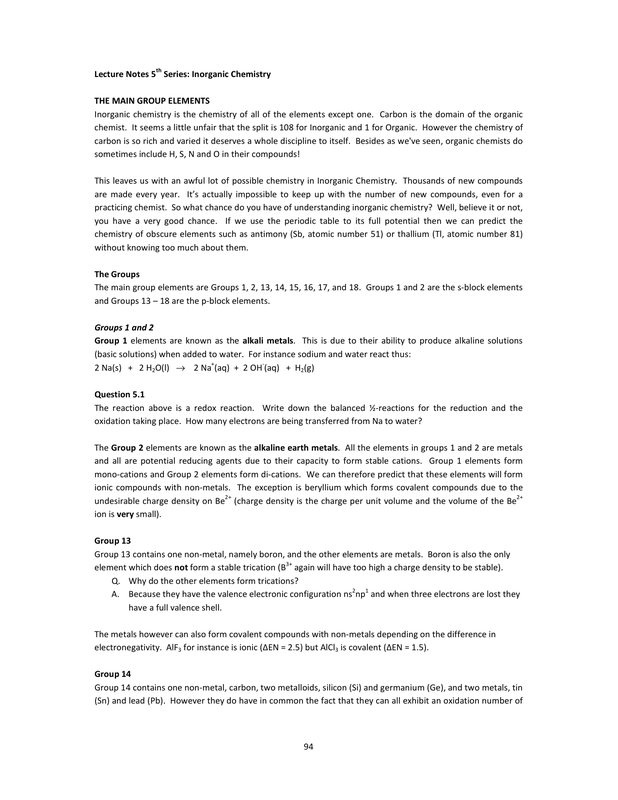 these discrepancies can be explained by looking at the electronic configuration of the elements involved. easier to remove and that is borne out by the numbers. will in fact have to go to the orbital diagram for each of the elements. expected and in fact it is less than the I value of nitrogen. Predict which of the following ions has the larger ionic radius: Mg or Al . different chemistry from their heavier congeners. One reason for this is that the heavier elements have dorbitals available to expand the octet of electrons that are available from the s-orbital and three p-orbitals. We have seen that N2 is a molecule which contains one σ bond and two π bonds. The π bonds form from porbitals which overlap in the following manner. oxygen, nitrogen and carbon often contain π bonds to those atoms. If we now go down Group 15 to the next element, which is phosphorus, an increase in atomic size results. nitrogen atoms can. This then results in a very poor overlap of the p-orbitals and a π bond cannot form. Phosphorus therefore does not exist as a P2 molecule with a triple bond between the phosphorus atoms. Each phosphorus atom now has eight electrons in its valence shell. P4 is called white phosphorus. π bond between the oxygen atoms. This is known as crown sulfur for obvious reasons. We have already seen that the physical properties of the elements depend upon intermolecular interactions. to the electrons not being confined just to one metal atom. Rather, they are free to roam all over the crystal. tungsten (W), has a melting point of about 3400 oC! aluminium which has three valence electrons it can donate to the ‘sea’. Why does the melting point temperature of the substance increase as we go down group 18? Would you expect solid argon (Ar) to conduct electricity? the same size. This is not the case in our next type of solid structure. we can envisage the anions packing together and the cations sitting in the holes in between. movement of charge can occur. elements occur as diatomic molecules and thus these diatomic molecules are the building-blocks for the solid. A molecular solid is one which contains discrete molecules packed together. temperature will be, due to the increased London forces present. bonded to the other atoms. or as the more exotic buckminsterfullerene. Diamond, graphite and buckminsterfullerene are said to be allotropic forms of the element carbon. Each allotrope has unique physical properties due to the different types of bonding within the structure. to three other carbons. This results in sheets of carbon atoms covalently bonded to each other. move within the crystal and thus the crystal conducts electricity. What is the hybridisation of the carbon atoms in the diamond structure? Are there any delocalised π electrons in the diamond structure? Will the diamond structure conduct electricity? directly from the difference in bonding. The sheet structure of graphite contains covalently–bonded carbons. structure and form two new bonds to those phosphorus atoms we will end up with the following structure. Long chains form and we end up with a polymeric structure known as red phosphorus. What type of crystal structure would you expect for red phosphorus? Which allotrope of phosphorus would you expect to have the higher melting point temperature? Allotropes are different structural units of an element. monoclinic sulfur. They are different polymorphs of sulfur. rhombic form melts at 113 C. They also have different densities and different thermodynamic properties. (polymorphism) can affect the physical properties of a substance. dissociates completely in water to form ions. are the carboxylic acids. Some other acids are listed below. Some strong and weak bases are listed below. Other weak polyprotic acids include H2SO3 (sulfurous acid), H2C2O4 (oxalic acid) and H3PO4 (phosphoric acid). hydrogens are known as oxo-acids. The reaction then results in the following. products are H3O+, the hydronium ion, and OCl-, the hypochlorite ion. What is the oxidation number of chlorine in HOCl? What is the oxidation number of chlorine in OCl-? What is the correct IUPAC name for the OCl- ion? What factors can affect the polarity of the oxygen-hydrogen bond in an oxo-acid? electronegative than iodine, therefore chloric acid is a stronger acid than iodic acid. bond becomes more polar and the acid strength will increase. In perchloric acid, the three oxygens double-bonded to the chlorine atom are highly electronegative. In general the more oxygens attached to the atom bonded to the –OH group the stronger will be the acid. Predict which of the following acids is the stronger - nitric acid or nitrous acid? Predict, with clear reasoning, which of the acids in 5.17 is the strongest acid. earth), the hydrosphere (the water) and the atmosphere. It is thus very important we understand the acidbase properties of these species. Predict the common binary (something that contains only two elements) oxides of the following elements. 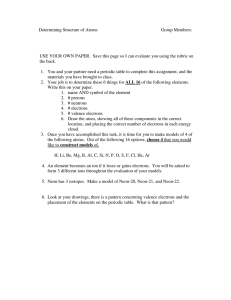 Predict whether the bonding in each of the oxides in the question above is ionic or covalent. and oxygen atoms). How do ionic oxides behave when added to water? Let’s look at the reaction between CaO and H2O. strong base that it does not exist in aqueous solution. Instead it reacts with water thus. Write a balanced reaction equation for the reaction between sodium oxide and water. We have thus formed sulfurous acid. Covalent oxides generally give rise to acidic solutions. and are known as amphoteric oxides. Aluminium oxide is an example. Some other amphoteric hydroxides are listed below. *You will notice that many metals form complex ions with four hydroxides. The other common number is six. Arrange the acids H2SO4, H2SO3 and HSO3 in order of decreasing strength. Arrange the acids HCl, HF and H2O in order of decreasing strength. Arrange the bases ClCH2COO , CH3COO and FCH2COO in order of increasing strength. 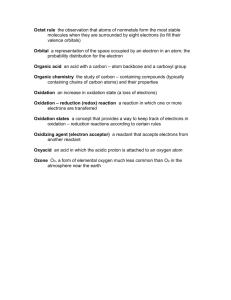 Which of the following oxides are basic? Identify all species in the following reactions as either an acid or a base. • Sulphur is in group 16 and the 3 period. • It exhibits many different oxidation numbers in its compounds, most commonly +6, +4 and –2. • Its oxides are covalent and thus acidic. • It can extend its octet in molecules and complex ions due to the presence of d-orbitals. What is the full electronic configuration of sulfur? How many electrons does it require to fill its valence shell? Give an example of a compound which contains sulfur in the following oxidation states. Which oxides do you know of sulfur? 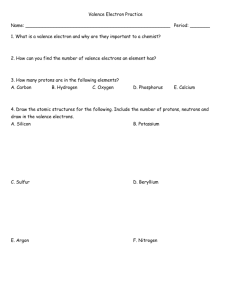 Which oxo-anions do you know of sulfur? Name a weak acid containing sulfur. Name a strong acid containing sulfur. prepared by oxidising elemental sulphur. The reaction sequence used in industry is called the contact process. What is the oxidation number of S on the RHS of the first and second equations above? What is being reduced in the second equation? H2S2O7 is known as oleum. What is the oxidation state of sulphur in this compound? Is the fourth equation a redox equation? Explain your answer. fertilisers. A common source of nitrogen is ammonium sulfate which is prepared in the following manner. As well as its acidic properties, H2SO4 is often used as an oxidising agent in chemical preparations. With stronger reducing agents such as zinc, elemental sulphur is produced. laboratory when one is trying to identify an unknown salt. Another use of H2SO4 in chemistry is as a dehydrating agent i.e. something which has a high affinity for water. H2SO4. The following reaction takes place. out of the reaction vessel. Some of the important information for the element nitrogen is listed below. • Nitrogen is in group 15 and the 2 period. –3 all occur in the natural environment. • Nitrogen is a non-metal and thus forms covalent oxides which are acidic in nature. • Being in the second period, nitrogen compounds and oxo ions normally obey the octet rule. How many unpaired electrons does an atom of nitrogen have? What is the oxidation number of nitrogen in the following gases? Identify each of the following species as a reducing agent, an oxidizing agent or both. Nitric acid is prepared on a large scale in industry via the Ostwald Process. acid/base properties are used in fertiliser manufacture such as in the production of ammonium nitrate. (instead of H2SO4) in the production of phosphate fertilisers from apatite minerals. essential elements for plant growth. Either NO(g) or NO2(g) can result. 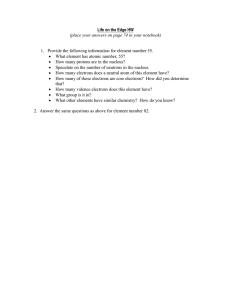 Calculate the number of electrons being transferred in each of the equations above. Assuming that NO2(g) is the by-product of the two redox reactions above, write balanced reaction equations. Like nitrogen, phosphorus appears in many forms in soils and waters, mainly due to its use in fertilisers. ourselves of some basic facts. Predict the shape around phosphorus in the following molecules. number of electrons being transferred. The white phosphorus thus isolated can now be reoxidised to prepare pure H3PO4. This is done in two steps. H3PO4 prepared this way is added to soft drinks such as Cola to give it an acidic, sour taste. in fact, met hydrogen peroxide in prac 3.
must have an oxidation number of –1. H2O2 has the following structure. How many lone pairs are present on each oxygen atom? Would you expect H2O2 to be a reducing agent or an oxidizing agent? Explain your answer. chemistry we know that alcohols can be oxidized and are thus reducing agents. whether we are in acidic or basic media. When H2O2 acts as a reducing agent it, itself, is oxidised and O2(g) is always evolved. Write a balanced equation for the reaction of H2O2 with MnO4- to form Mn2+ in acid solution. circumstances. Consider the following reaction. Is H2O2 being reduced or oxidised? What name is given to this type of reaction? chemistry is their ability to form a range of oxo-anions and oxo-acids. The elements occur as diatomic molecules, all of which are oxidising agents. Would the following reaction go spontaneously to the left or to the right? The above equation is in fact how liquid bromine is produced on an industrial scale. 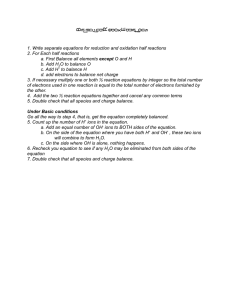 Balance the following reactions and calculate the number of electrons transferred. Aqueous solutions of iodine are often used by analytical chemists in titrimetry. Typical reactions involving iodine are shown below. HTH. HTH is manufactured by the following reaction. We have already noted that the hydrogen halides, HX, are acidic. HF can be prepared by the following reaction. preparation to form Br2 and I2 respectively. Write down a balanced reaction for the reaction of HBr with H2SO4 if the products include Br2 and SO2. HBr and HI are thus prepared from the reaction of a suitable salt with a non-oxidising acid such as H3PO4. In your own words explain why H2SO4 does not oxidize HF to F2. One acid worth particular mention is perchloric acid. Perchloric acid is the strongest of all the common acids. is prepared by treating chlorine with a concentrated alkali in a disproportionation reaction. ClO3 is again a powerful oxidant and is used as such in fireworks and safety matches. Chlorate salts decompose when heated. Two different reactions occur depending upon the conditions. Balance each of the above reactions. oxygen. When the oxygens are also bonded to hydrogen, a whole array of different oxoacids results. Draw Lewis dot-cross diagrams for the following species.